Tascam isn’t the only pro audio company coming out with a prosumer level digital audio recorder. Yamaha announced the Pocketrak 2G last week and it packs an awful lot of power into a tiny package. The recorder also has a built in USB jack which allows you to connect it to a computer without using a cable. 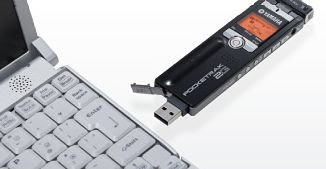 The Pocketrak 2G will be available in April for $449. While the size and built in USB connector are attractive, I’m a bit skeptical of recorders that have only mini jacks. While the mini inputs on my PCM-D50 sound pretty clean, they are also made of aluminum which gives me some confidence that they aren’t going to break. The cheap plastic mini jacks you get with many lower cost recorders are often the first thing to break when you plug and unplug microphones and headphones repeatedly. I can’t say for sure, but from the images available it looks like the Yamaha recorder uses plastic jacks. But as always, I’ll reserve final judgment until we get some real world reports. … trying to decide between this and the sony; they both *look* extremely neat and both can do what I want (live acoustic music recording) but… considering the internals cost *maybe* $100, in either case is there like $400 worth of mics and AD’s ?